We give you the gift of storage! 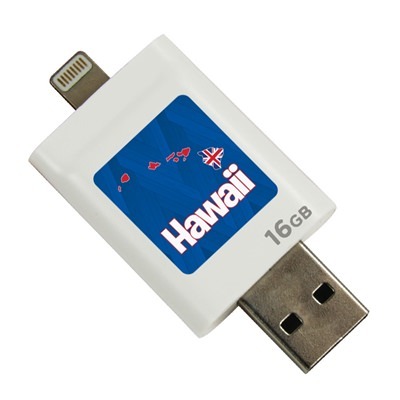 With a qualified purchase, you’ll receive this fabulous white Hawaii Islands iFlash Lightning to USB 16GB drive! Use this drive as an external hard drive for your Apple phone or tablet. With a standard USB and Lightning connector, you can use this drive to back up or transfer movies, photos and important files. This drive has an ample storage space of 16GB, perfect for any project or movie collection you have to store. The plastic body is durable, and provides a wonderful backdrop for the Hawaiian island image that’s just “maika’I loa” (awesome)! Please enjoy your free gift!